Before Iron Maiden, Dickinson was the singer in a similar band called Samson from 1979 until he joined Iron Maiden two years later in 1981. In Samson and previous bands, he went by the name of "Bruce Bruce". During previous years, he was in Styx (1976) (not to be confused with the American band of the same name), then went on to sing for Speed (1977 - 1978). When Speed split up, he joined Shots until the summer of 1979. He made his recording debut with Iron Maiden on their Number of the Beast album in 1982. Dickinson quit Iron Maiden in 1993 in order to pursue his solo career and was replaced by Blaze Bayley, who had previously been the lead singer of the metal band Wolfsbane. Dickinson's solo work ranges from the Alternative Rock sound of 1996's Skunkworks, to the all out Metal style of Accident of Birth. 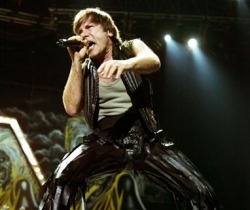 Dickinson was releasing an artistic energy he felt was suppressed by Iron Maiden's strict progressive metal format, which he claimed could not accommodate emotional reflection as evidenced in the lyrics of "Tears of the Dragon." After releasing two traditional metal albums with former Maiden guitarist Adrian Smith (which were arguably more akin to the genre than Maiden's epic format), Dickinson rejoined the band in 1999 along with Smith. Both are still in the band to date. Since then, Dickinson has only released one more solo album (Tyranny of Souls) but says his solo career is not over. He has signed a contract with his label to do 3 more solo albums. Harris' first band was named Influence, which was later renamed to Gypsy's Kiss. He later joined Smiler, of which all the band members were several years older than he was. He ended up leaving, as the members of the band made it clear that they did not care for a bassist who leapt around the stage and wrote songs. After Smiler, Harris went on to create Iron Maiden, getting the name from seeing an iron maiden, a type of torture instrument, in the movie The Man in the Iron Mask. Steve Harris is Maiden's principal composer and lyricist. Harris's songwriting has been noted for a galloping bass pattern and long songs with epic lyrics that feature many tempo changes. Influenced by 1970's progressive rock bands like Yes, King Crimson, Genesis, and Emerson, Lake, and Palmer. Harris frequently writes lyrics about mythology, history or topics inspired from books and movies. Harris has commented on the difference between 1970s progressive music (called "progressive") and contemporary progressive-style music (known as "prog"), a distinction which is becoming recognised. 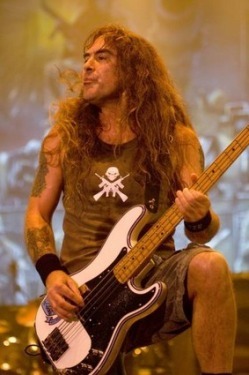 Steve Harris is often considered among the best and most influential heavy metal bassists. He is most known for his use of triplets - three quick consecutive notes – which he plays with two fingers. Before playing, Harris often chalks his fingers, to make such triplets easier to play, as shown on the bonus DVD for the A Matter of Life and Death album. Besides this he is very adventurous on the bass and plays intricate accompaniment in many of Maiden's songs. He also uses power chords, which are relatively unheard of on bass, on several songs. Harris has also stated that he never uses a pick and that he never warms up before a show. He plays a specially-painted bass guitar which has been featured on every Iron Maiden album recorded. It is currently sporting the West Ham United F.C. logo. The guitar has gone through three colour changes since construction. Originally being white, it was then changed to black, then blue, and is currently cream with the rim done in West Ham's light-blue, and the club's logo on the body. The pickguard is metallic. He is also known to use a West Ham United football scarf to cover his strap. In the 1970s, McBrain played drums on some Pat Travers albums, and also played for Streetwalkers from 1975 to 1976; he also appeared in the band McKitty in the early 1980s. It was during a McKitty gig in Belgium that he first met Iron Maiden bassist and founder Steve Harris. He joined Iron Maiden in December 1982 for the 1983 Piece of Mind album, replacing Clive Burr, after McBrain's previous band Trust had supported Iron Maiden on the 'Number of the Beast' world tour in 1981. As part of this tour, Nicko had to dress up as the devil and scare the audience before confronting Eddie. On one night of this tour, he stood in for Burr, and he has been with Iron Maiden ever since. In his role in Iron Maiden he has been cited as a major influence by many modern drummers in a wide range of styles, and often holds drum clinics for fans and drummers alike. McBrain's first songwriting credit with the band is on the song "New Frontier" from the their 2003 album Dance of Death. McBrain also claimed he had written a song for 2006's A Matter of Life and Death but because he met with the band late in the writing process, there was no space on the album for it. He has filmed several short videos for the band's official website and keeps a diary when the band is on tour, which can be read by Fan Club members. These diaries reveal his endearing, wacky sense of humour and his affection for his fans. Dave was first inspired to play guitar, after hearing "Voodoo Chile" by Jimi Hendrix. After that he got his first guitar, and started a band called Stone Free. 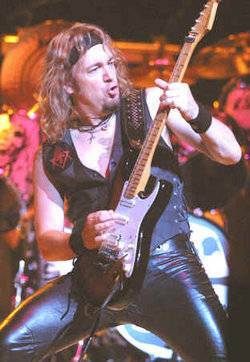 Stone Free also included Adrian Smith who also later became part of Iron Maiden. After Stone Free he was in a number of different bands. But when he met Steve Harris, he joined up with Iron Maiden, in 1976. But he had an argument with the vocalist Dennis Wilcock, and he left and joined with Urchin. He put out one single and joined back up with Iron Maiden. Dave has a definite sound as a guitarist. He leans more to a legato style than anything else. 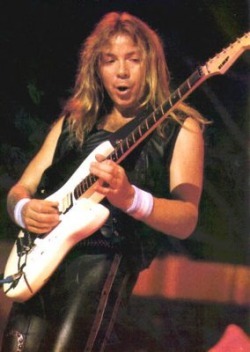 Adrian, as a child, was good friends with Dave Murray. He bought his first guitar from Murray. It was in bad shape, but his dad had fixed it up. At first Adrian was lead vocals and lead guitar for Urchin. But after joining up with another friend of his, Steve Harris, he joined Iron Maiden. Adrian seems to be a genious with music. His solos are rarely improvised. He plays them in a legato style similar to Dave Murray. His fast passages have musical function and relationship to the chord structure behind the solo. They draw from modes and arpegios and often have a blues like feel to them. 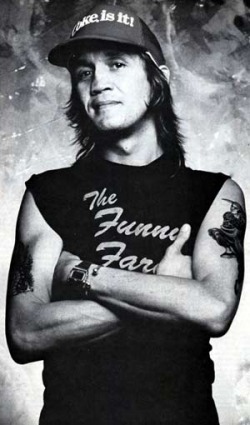 Adrian left Iron Maiden in 1990 because he didnt like the direction that the band was taking with there music. After he left Steve Harris decided to take the band back to a more traditional style of rock. And in 1999, he rejoined the band, and remains with them to this day. In 1990, Janick was asked to replace Adrian Smith in Iron Maiden. 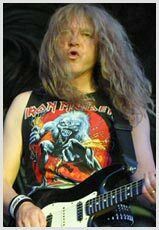 Prior to joining Iron Maiden Janick was in a number of bands. White Spirit, Gillan, Gogmagog and a couple others. He has a very energetic stage presence, he is more outgoing, it would seem, than the other band members. So he adds a certain spark to the band. Even after Adrian Smith rejoined the band in 1999, Janick stayed with Iron Maiden. And he is shredding with them to this very day.